I create figurative, portrait, and animal sculptures from used tires and steel. A former stone sculptor, I became inspired by the natural landscape of my home in Dingle, Ireland and my love of cycling to find a more environmentally sustainable and less chemical-intensive art medium than the traditional stone works. Used bicycle tires discarded by local bike shops – which are both highly flexible and also durable - were a clear choice for me given my love of cycling and interest in recycling. Through my artwork, I love to explore the body form, whether human or animal, while striving for classical elegance. Using tires - a new and original medium - I combine a classical style with a contemporary spin, to facilitate a wider appreciation of this unique art form. I especially enjoy that my sculptures give a new use to old tires, bringing environmental awareness to the arts. I studied art the Dún Laoghaire College of Art and Design (IADT): Dún Laoghaire, Co. Dublin, Ireland, as well as the College of Marketing and Design: Co. Dublin, Ireland. Exhibited ‘Einstein’, purchased by and featured at the Museum of Transport and Technology in Munich for one year, in a new exhibition entitled ‘Balancing Acts’; from 18/07/2017-18/07/2018. Exhibited 12 of my tyre sculptures at a solo exhibition in Munich; featured from 23/11/2016 – 23/12/2016. Exhibited 13 of my tyre sculptures at the Recycling and Waste Management (RWM) exhibition, held at the UK’s National Exhibition Centre (NEC), over three days; 13/09/2016 – 15/09/2016. Exhibited my tyre portrait sculpture, ‘Rodin’, at the Society of Portrait Sculptors; from 18/05/2015 –23/05/2015. Exhibited 14 large experimental tyre sculptures of figures and animals; featured from 23/03/2015 – 12/04/2015. 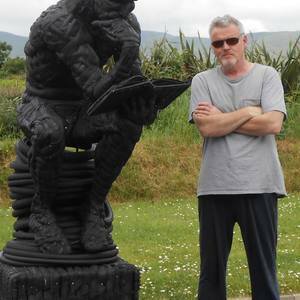 My tyre sculptures have featured in solo exhibitions, museums, art festivals (such as Feile na Bealtaine in Co. Kerry, Ireland), and private collections throughout Ireland and abroad, including in Germany, Switzerland, England, Northern Ireland, and the US. Other notable exhibits include: ‘Dragon’s Head’ commissioned by and featured at the Game of Thrones Studios in Northern Ireland; three pieces featured at the Sculptures in Context Exhibition in the National Botanic Gardens in Dublin, Ireland.